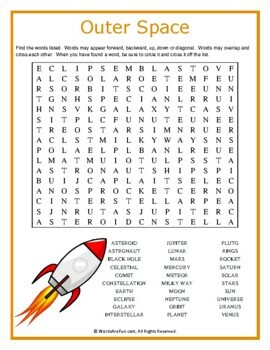 A word search puzzle featuring words associated with outer space. 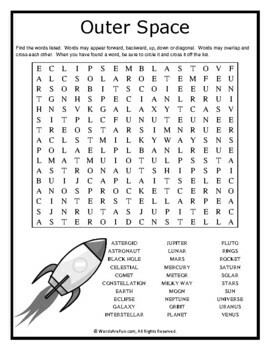 This word search puzzle is truly out of this world! Use this sheet as part of your teaching curriculum, a treat for early finishers or just for fun. I have included 30 words in the list. Words may appear forward, backward, up, down or diagonal. Words may overlap and cross each other. When you have found a word, be sure to circle it and cross it off the list. Word List: Asteroid, Astronaut, Black Hole, Celestial, Comet, Constellation, Earth, Eclipse, Galaxy, Interstellar, Jupiter, Lunar, Mars, Mercury, Meteor, Milky Way, Moon, Neptune, Orbit, Planet, Pluto, Rings, Rocket, Saturn, Solar, Stars, Sun, Universe, Uranus, Venus. Word search solution is included. Word searches are not only a great way to pass the time, they also make fantastic teaching aids. My puzzles can be used by a variety of people (teachers, managers, religious leaders, professors, and parents just to name a few) to help others instill important facts and lessons. And they're TONS OF FUN!! Need help finding the words. . . .